During the week of June 14- 18, I will be giving a workshop at the Woodstock School of Art. In my blog I have covered many issues regarding Robert Henri’s use of color and the spectrum palette. I will spend a significant amount of time in this workshop demonstrating these ideas and how to apply them to the figure as well as one’s own work. Each participant will mix the spectrum palette that corresponds to their own choice of colors. Taking this palette we will expand it to a harmonious palette of 12 colors that relate to the spectrum band. This will be the solid foundation on which we will do further exploration covering a set palette; a limited palette based on chords of H.G. Marratta as expressed by Henri; a limited palette of primaries with varied intensities- i.e. 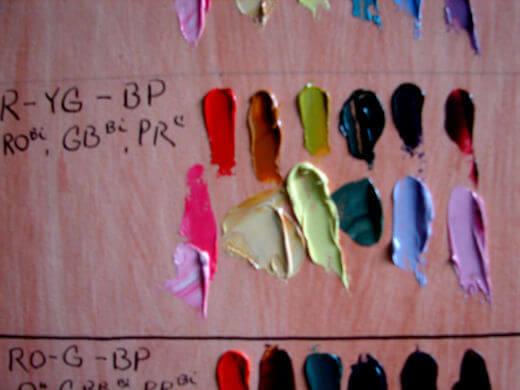 Frans Hal’s palette. In the process of working from the model, we will develop etudes to express our color objective and use these as a reference to enlarge upon our ideas for the image. The model will provide for the concrete application of these color theories and explorations. We will touch upon Cheveral’s theory of harmony of sequence as well as his theory of colored edges. We will also concentrate on color temperature, developing a map that allows us to grasp the variety and unity of temperature and merge this with our observation of the model. By working through this experimentation with one’s palette, the student will become knowledgeable of all the possibilities that lay before him hidden in his palette. One will no longer have to rely solely on mixing the same phrases repeatedly to achieve a sense of harmony. It will also heighten the students sensitivity to color and increase one’s color memory. Once the student becomes acquainted with this type of working method, he will be able to carry on further experiments in his own studio. The objective is to become familiar with the theory, experiment in several modes and give it concrete application through the use of two models over the course of 5 days. The student will leave the workshop with a chart of the spectrum palette; two studies of a chord palette; Hal’s palette; two or more etudes and two paintings worked toward completion. The things I have learned about color in the few figure painting classes of yours that I have been able to take has made such a huge difference in my own art work that a week long workshop should be a real life changer. I can`t wait ! That sounds like a fabulous workshop, I wish I were closer so I could attend. Thanks for the info.